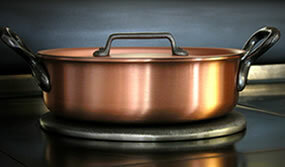 Our range of copper cookware is to be used on classic stoves with gas, electric or ceramic heaters. Instead by using induction stoves, an iron nucleus is necessary. Because copper is not inductive, we propose a heavy cast iron plate who should be positioned on the magnetic field. With this plate a use of all FALK copper cookware is also possible and keeps all advantages for a well known gourmet cooking.